Ballots are being counted in Nigeria's closely fought general election, although voting was extended to a second day on Sunday in some areas. Due to logistical problems and some cases of violence, polls have been put back to a later date in other areas. Whoever wins in Africa's most populous nation and largest economy will have to address power shortages, corruption, security threats, and an economic slowdown. President Buhari cast his ballot in his hometown of Daura in the northern state of Katsina. Asked if he would congratulate his rival if he lost, he said: "I will congratulate myself." Results are not expected until Monday at the earliest. A coalition of civil society groups reports that a total of 16 people were killed around the country - this is less than in previous elections. Two people were arrested in the Surulere district of the commercial capital, Lagos, after voters were attacked by a group of young men "brandishing weapons: cutlasses, axes and stakes", one witness told the BBC. "What they were saying was that if you were not [voting for the ruling party] APC, you'll be attacked," Ralph Onodike, who sustained an arm injury, told the BBC. But Inec official Festus Okoye said the commission was "generally satisfied with the process and the procedures for the conduct of these present elections". He said 68% of polling units had opened by 10:00, according to Reuters news agency. The candidate with the most votes is declared the winner in the first round, as long as that person gains at least 25% of the votes in two-thirds of Nigeria's 36 states. The president's All Progressives Congress (APC) has promised to take the country to the "next level", arguing that in his first four-year term Mr Buhari has done a lot of "foundational work" that may not be immediately obvious. Mr Abubakar and his People's Democratic Party have pledged "to get Nigeria working again", saying that the president has wasted the last four years. Both men are from the mainly Muslim north of the country. While they are in their 70s, more than half of Nigeria's 84 million registered voters are under 35. Nigeria is Africa's largest oil producer but corruption and a failure to invest the proceeds from the industry have hampered development in the country. 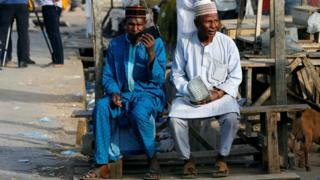 Mr Buhari has quelled a militant Islamist rebellion in the north-east of the country, but Boko Haram remains active. There has also been an upsurge in violence in the country's Middle Belt as traditional herders and more settled farmers have clashed. Mr Buhari was elected in 2015 - the first time an opposition candidate had defeated an incumbent to become president.